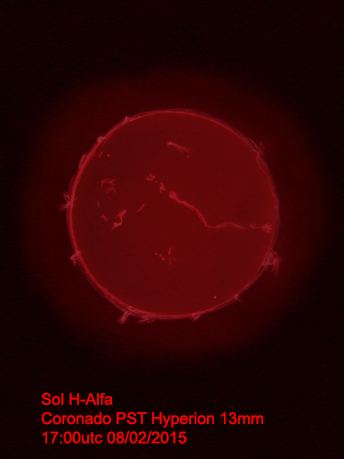 Todays solar surface showed some interesting features that I tried to capture. There were a lot of long detailed filaments as well as a region to the east that looked like a piece of silk that had been crinkled and then flattened. 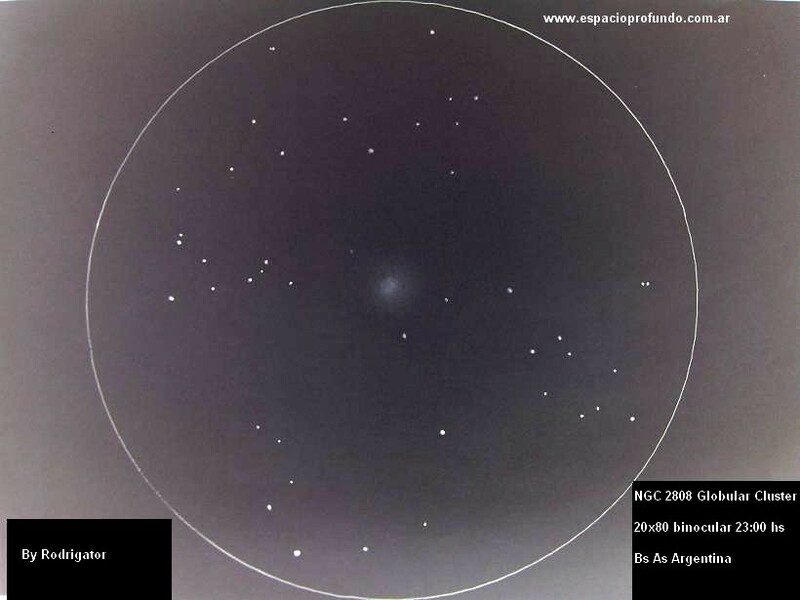 To the west of this area was a brightening plage, at the moment the brightest region in the observation besides a bright spike on the limb. 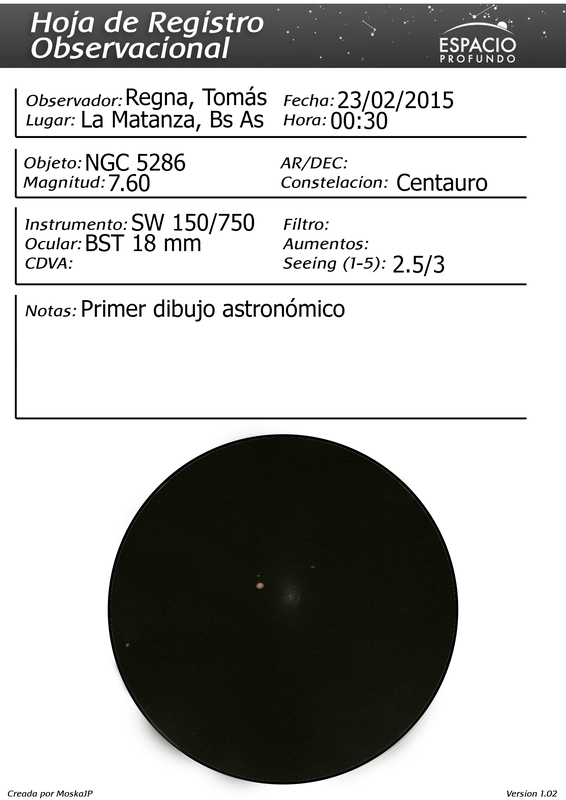 The prominences to the north were more subtle and dim. Hi ASOD. My name is Renato Trono Figueras. I’m 15 years old. I’m from Lincoln, Buenos Aires, Argentina. I hope you post my sketch soon. Thanks you very much! 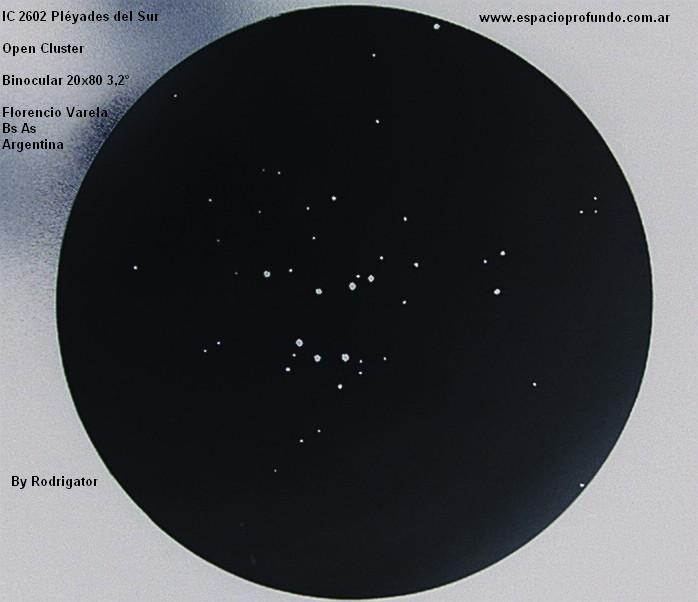 January the 10th the two inner planets of our solar system are very close. Following the nice pastel sketch made by Frank Jan 6th (ASOD Feb 2nd) I will take the opportunity to compare its view with this I made 4 days later. 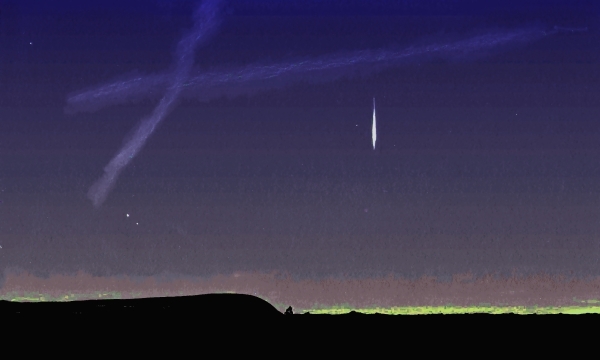 While my watercolor session, a probable Quadrantide meteor produce a brilliant flash. 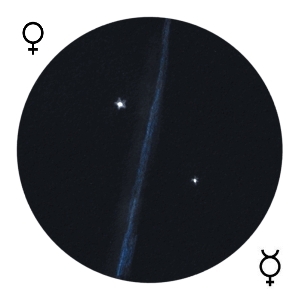 The two planets are easily seen in the field of my UWA EP. Bueno pues vos presento el dibujo de esta noche, que trabajo me ha costado. 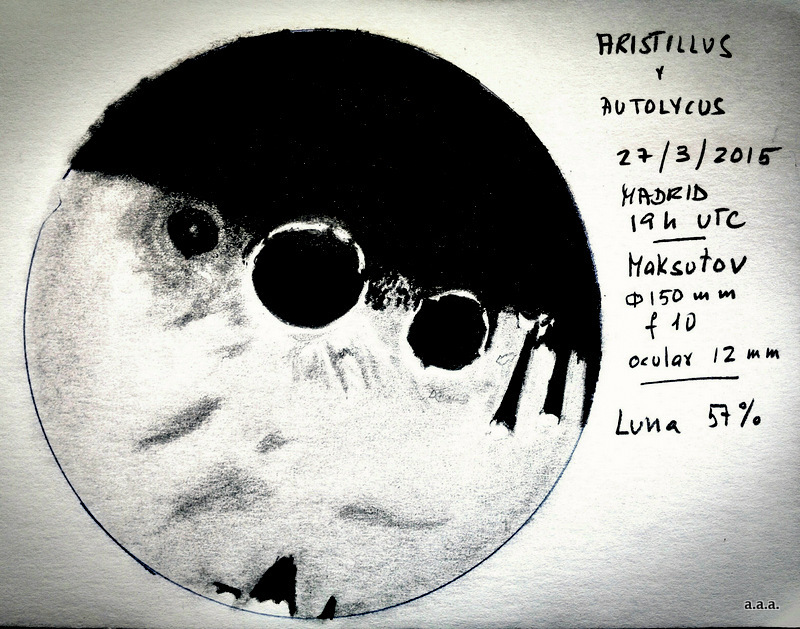 Mas de una hora dibujando y a merecido la pena para poder plasmar tanta belleza en un papel con unos lapiceros de grafito, un difumino y mucha paciencia. Well I present you tonight’s drawing, that work has cost me. More than an hour drawing already worthwhile to capture such beauty on paper with a graphite pencils a stump and patience. 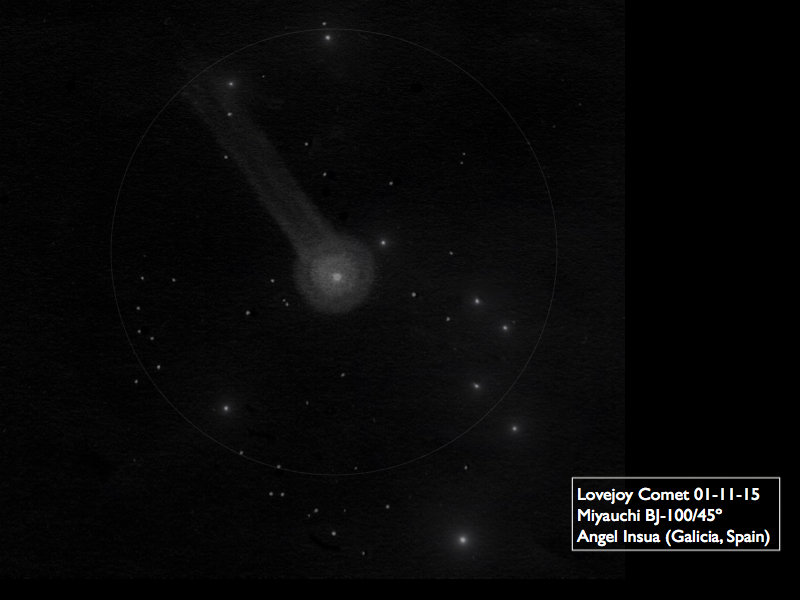 Info: This sketch was done using a Newtonian telescope, 150/750 f5, at 1 a.m. . Seeing was tolerable. Eclipse totale de Lune du 4 avril 2015, observée au T400x80 à Nouméa, lors d’une soirée publique. Ce chapelet est un compositage de 5 croquis (crayons de couleur sur papier blanc) où sont notées le rendu global (teintes, lumière, position) avec un dessin de pleine Lune réalisée le lendemain. Les nuages en début de séance ajoutent un effet interessant. Total lunar eclipse of April 4, 2015, observed T400x80 in Noumea, at a public event. 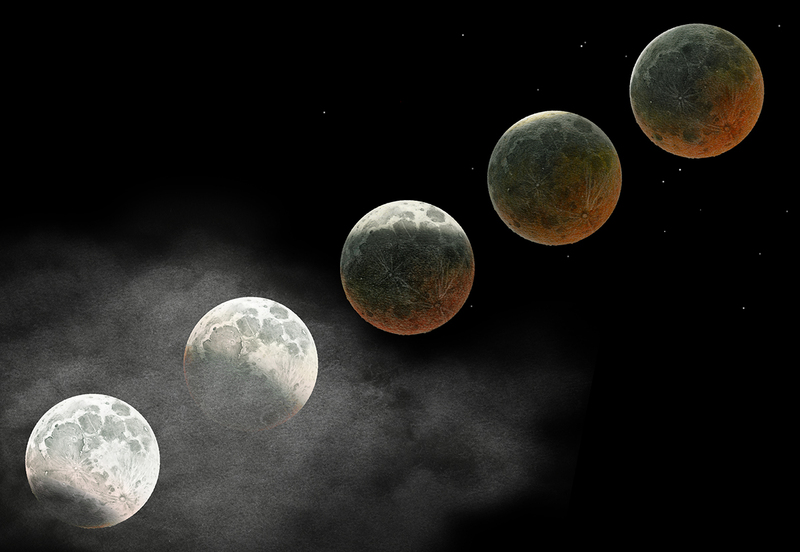 This rosary is a composite of five sketches (colored pencils on white paper) which are rated the overall rendering (colors, light, position) with a full moon made the next drawing. The clouds in early trading add an interesting effect. Hi ASOD , this is my second version of the sketch ! Objetive : Ptolomeo Open Cluster , or M7. 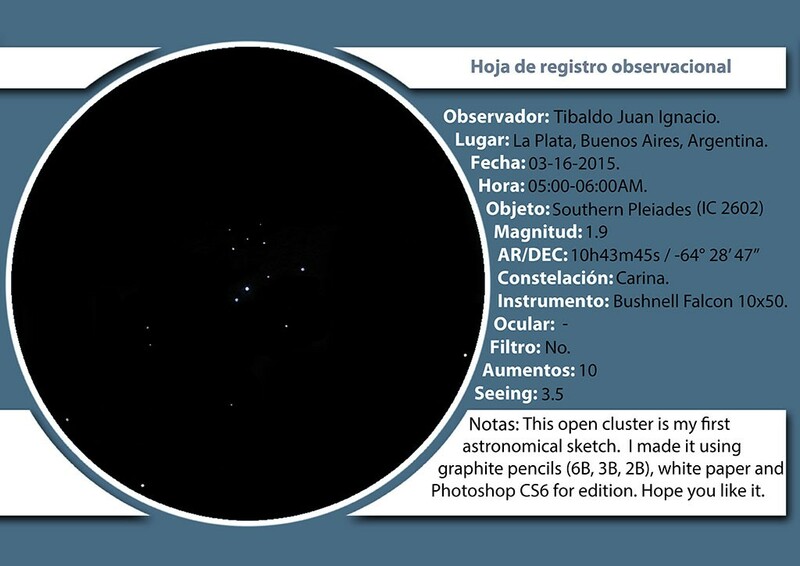 The sky was clear but the nova was very low on the horizon, with binoculars it looked splendid and bright. 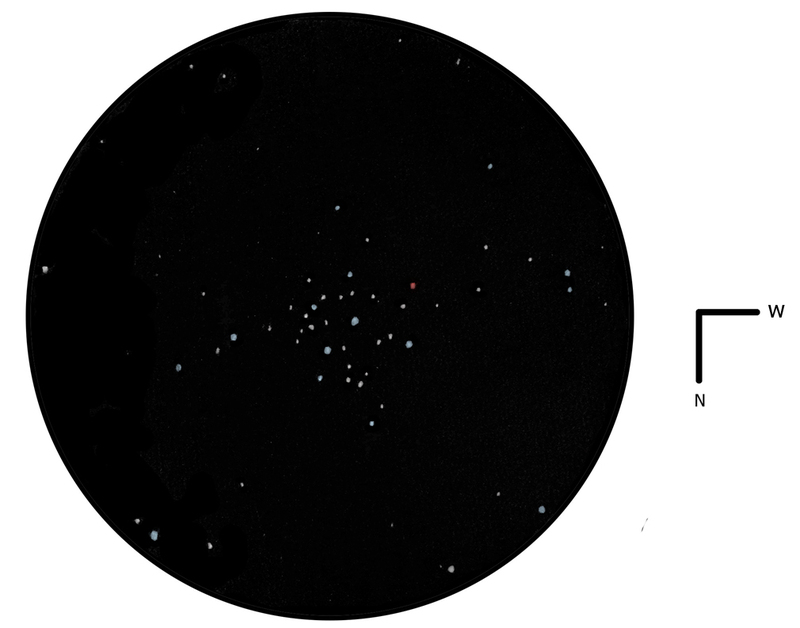 Although very easy to locate from Nunki naked eye vision was difficult due to its low height. Location: Boadilla del Monte, Madrid. Polluted suburban skies. SW refractor 102/1000; Ocular 25mm; 40x; No filter; No barlow. Media: Black pencil on White paper. Inverted colors with Fitswork. Object Name: NGC 4527, NGC 4533 and NGC 4536. Location: Doyle, Bs. As., Argentina. 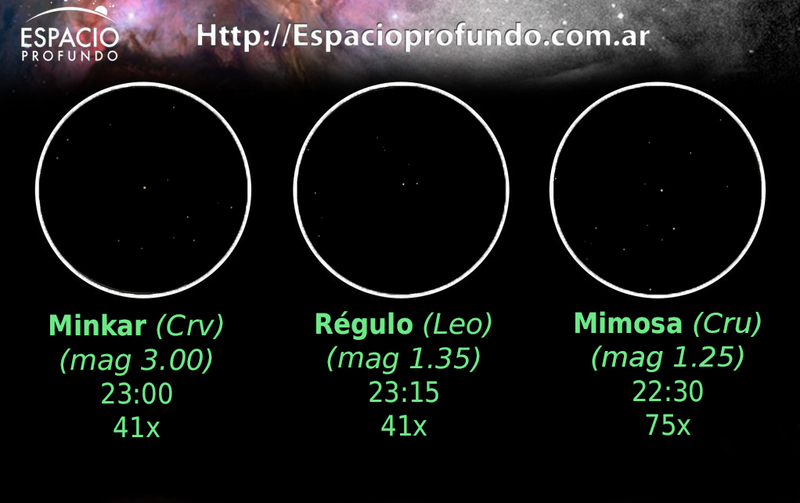 Star party! Conditions: Very good transparency, bad seeing. Rural sky. Media: 2B, HB, 2H, blend stump and PS for color. 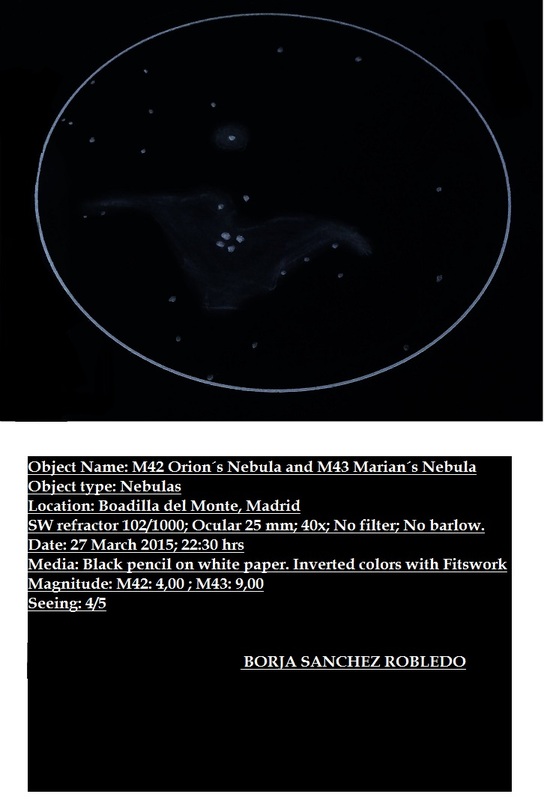 Eyepiece: ES 24mm 68º, BST 18mm 60º and TMB II 6mm 60º (for NGC 4533). Hi ASOD! 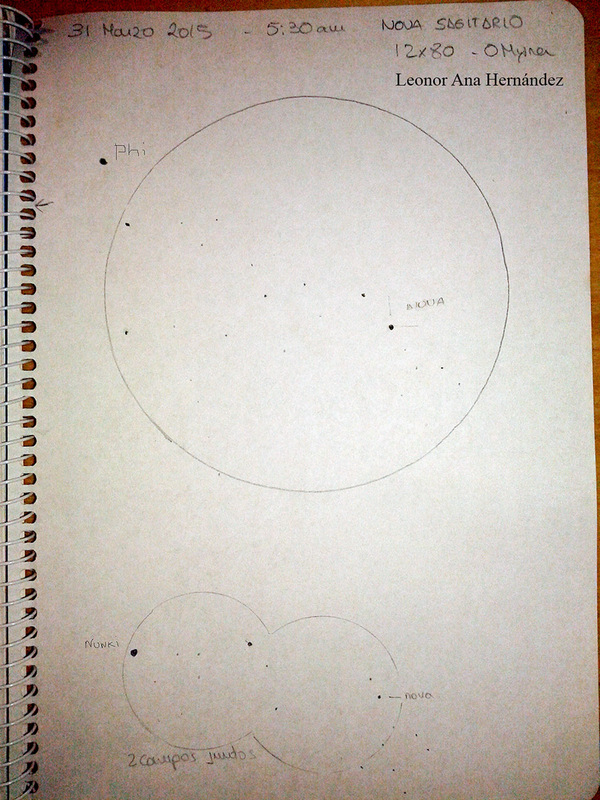 Here’s my sketch of this stunning pair (or trio) of galaxies located in the constellation of Virgo. 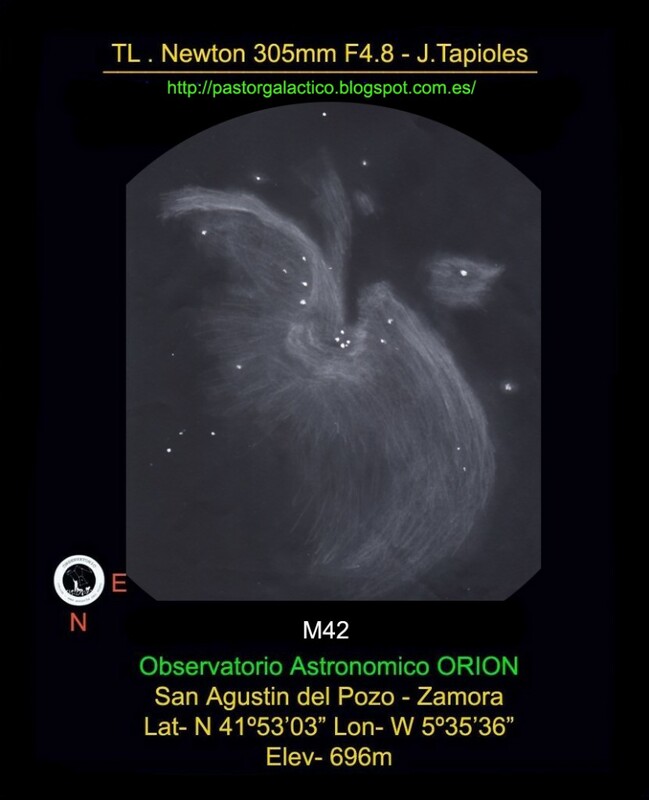 I stumbled across these galaxies by mistake when I was searching the quasar 3c 273, lucky me! 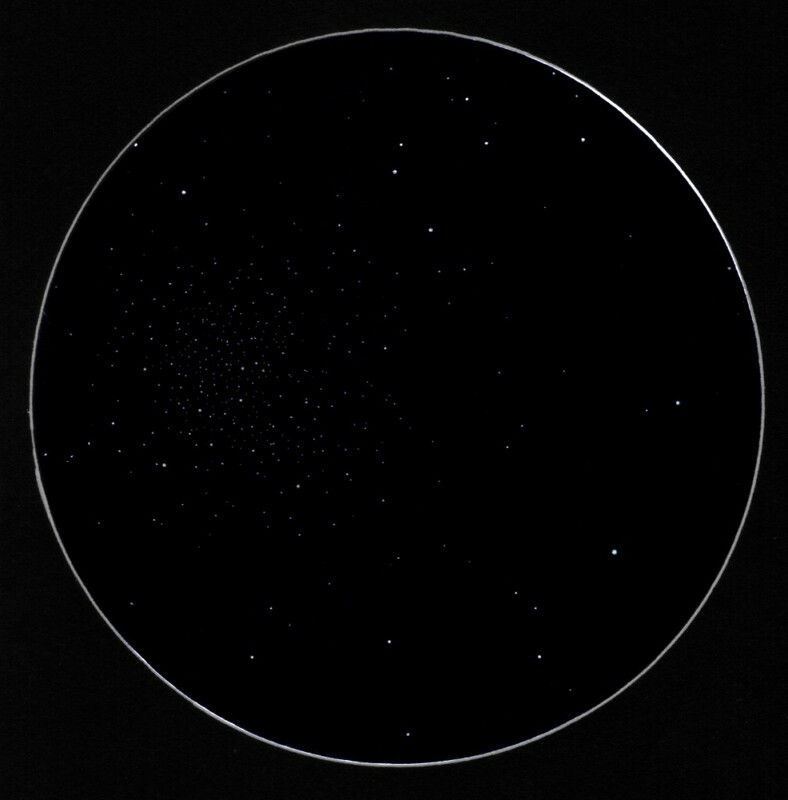 This sketch contains the open cluster NGC 1502 and an asterism made up of a 2 1/2° chain of stars that forms a line from the cluster towards the northwest called Kemble’s Cascade. 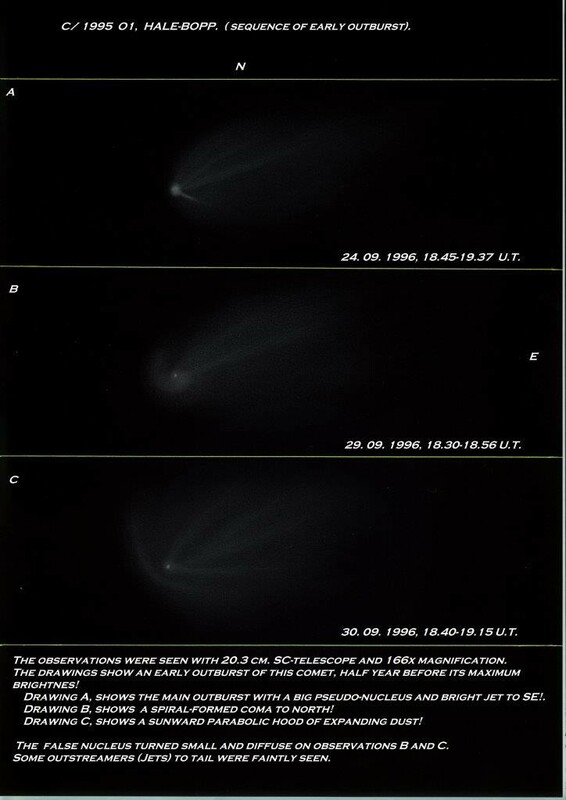 Kemble’s Cascade was so named by the late Walter Scott Houston, who authored Sky and Telescope’s magazine column “Deep Sky Wonders” for decades. Lucian Kemble was the person who sent Houston a description and drawing of the cascade. Thinks are moving in our planet system. It’s why “planetos” in Greek means “vagabond”. 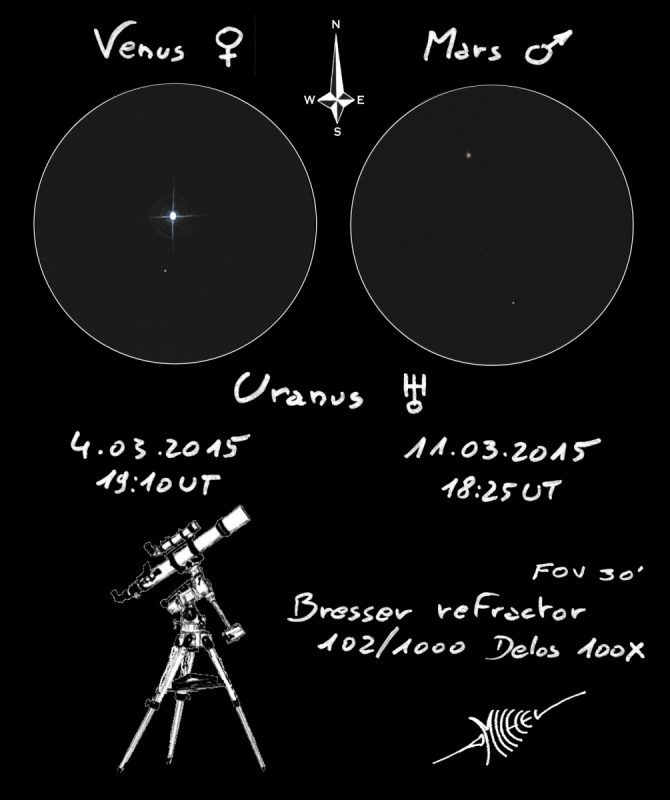 So I use the opportunity of this double conjunction just a week from each other to find Uranus and its so nice colour. 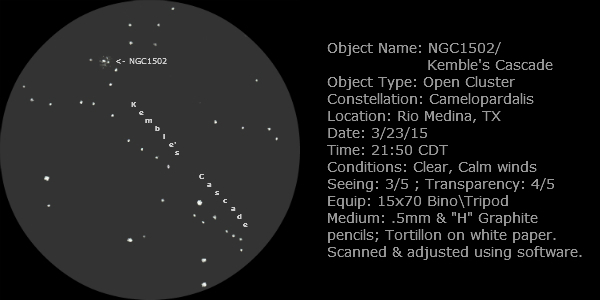 The faint K star between Mars and Uranus is HIP 4325 mag=9.5, so no Uranus satellites were visible with my material. 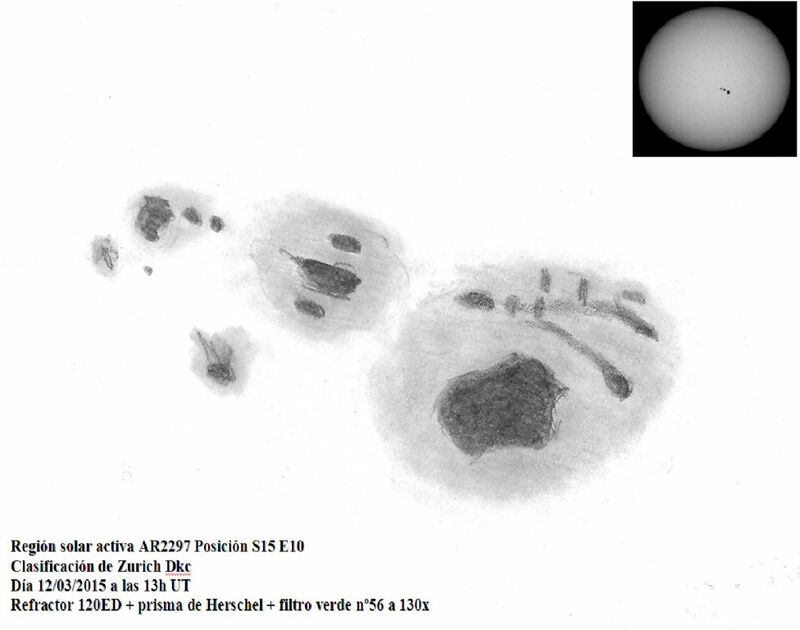 I sketch the two fields on white watercolour paper with inverted method using a chromatic wheel, orange for Venus, blue for Mars and crimson red for Uranus then I just have to invert the two sketches after scanning. The deal is to manage the colour values in inverted mode. 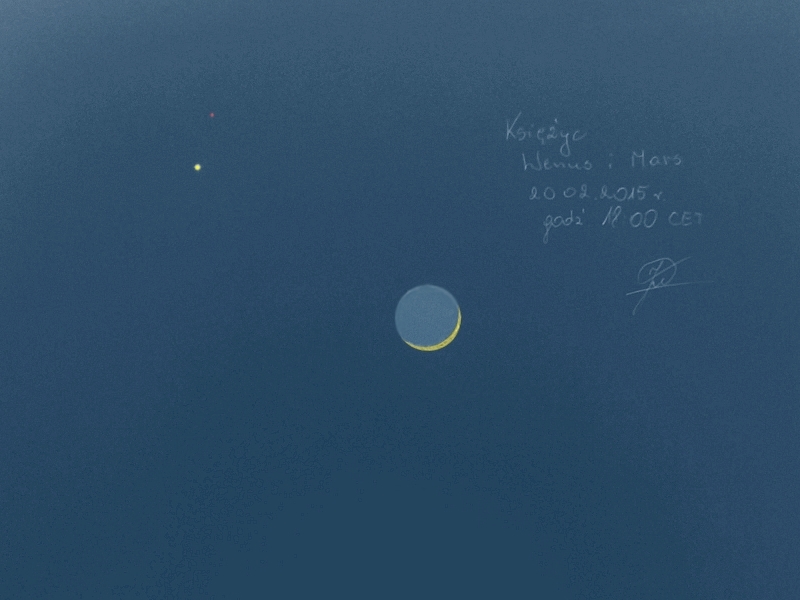 Clear sky to you all, and for some of you I wish you a nice eclipse on Mart 20. 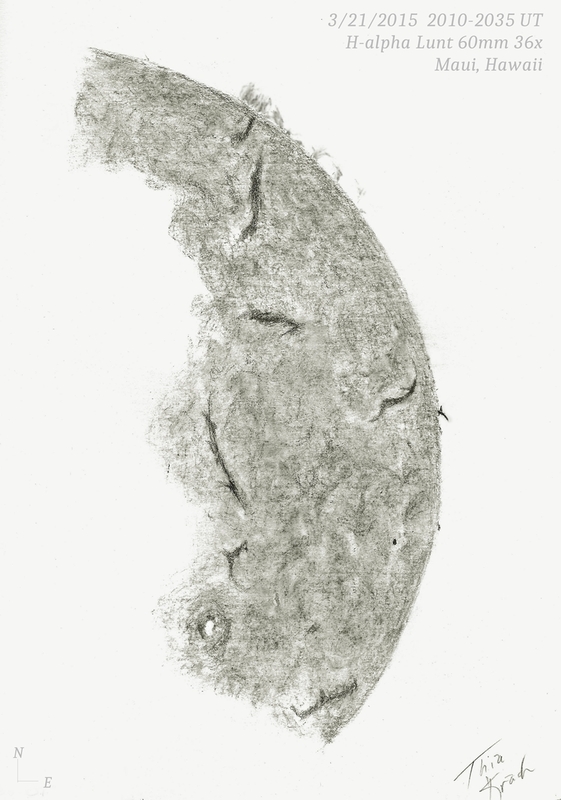 My first solar drawing, I hope you will enjoy it. Last week at the 26th. 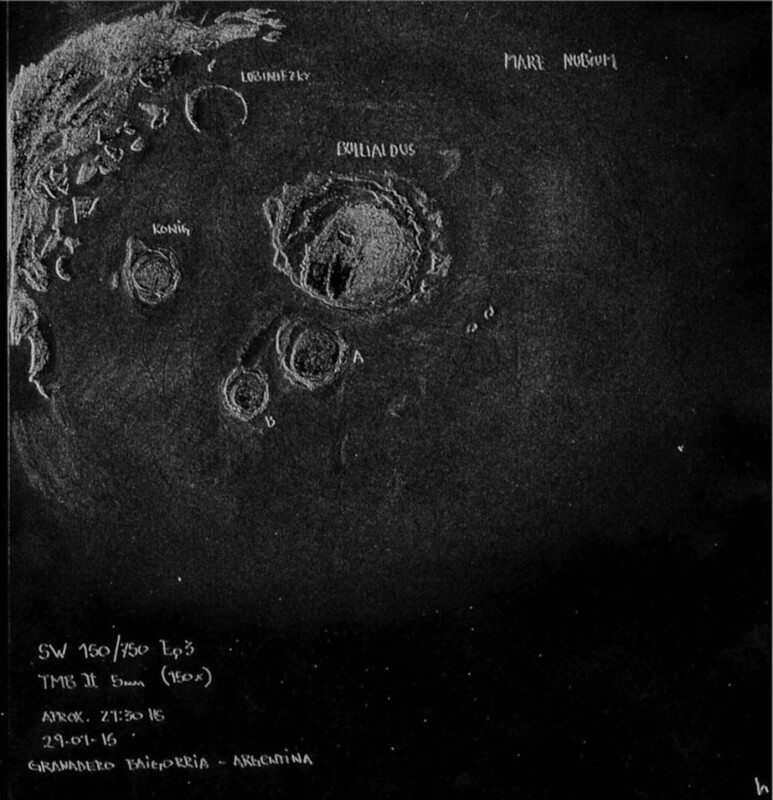 February I took the chance to make a sketch of the mutual moon cover. 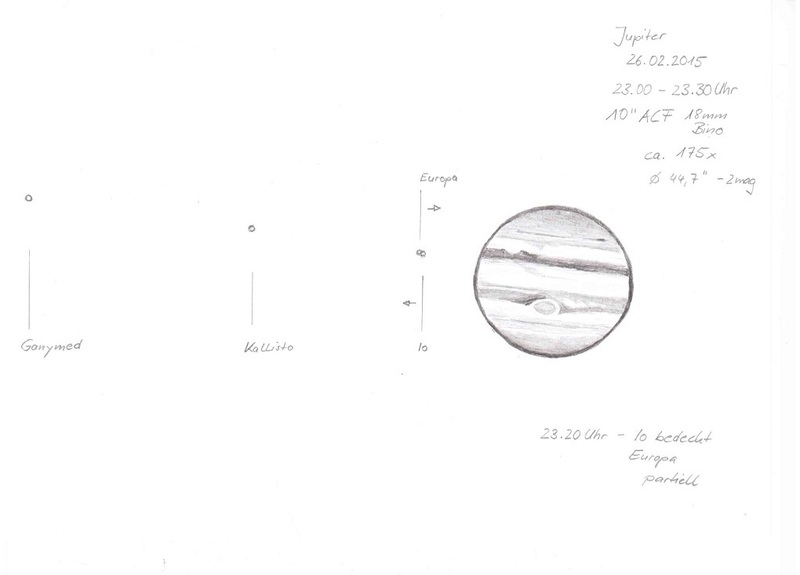 Of course, I also observed Jupiter. The air was not so good but in quite moments there were some details to hold. All in all it was a real fantastic night. 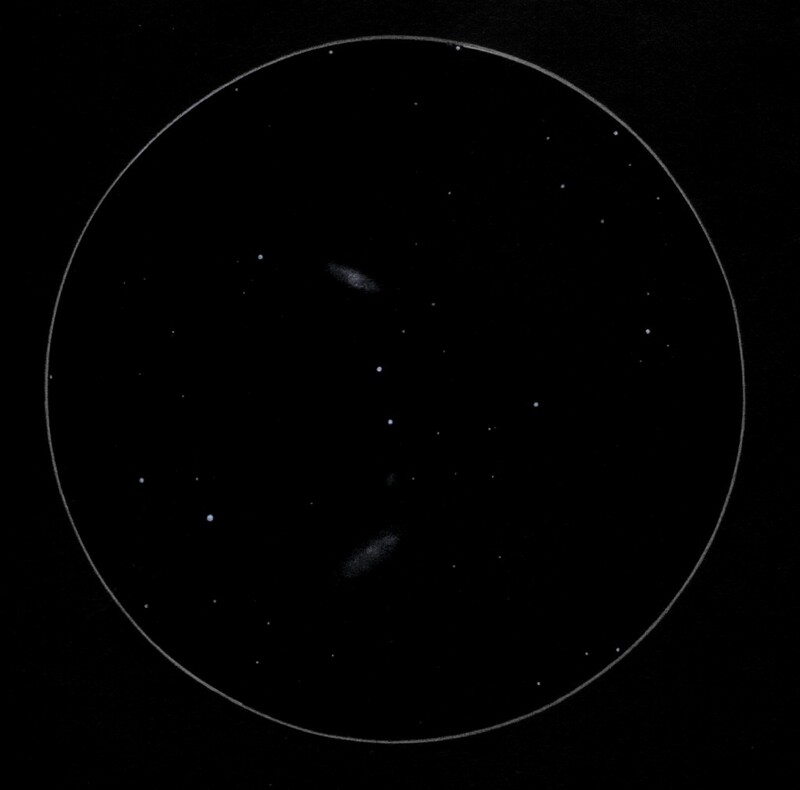 First ran Callisto and its shadow over the planet. 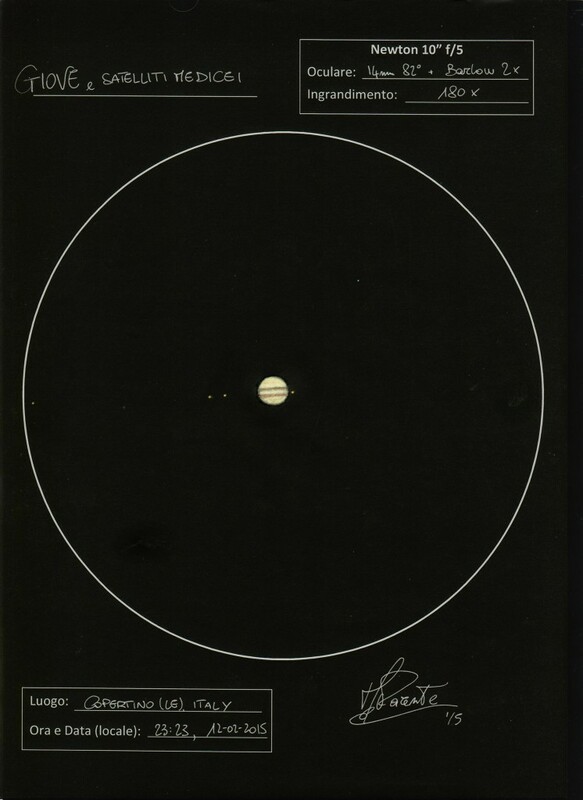 Then Kallisto covered Europa and at last moved Io over the planetary disk followed by his shadow. 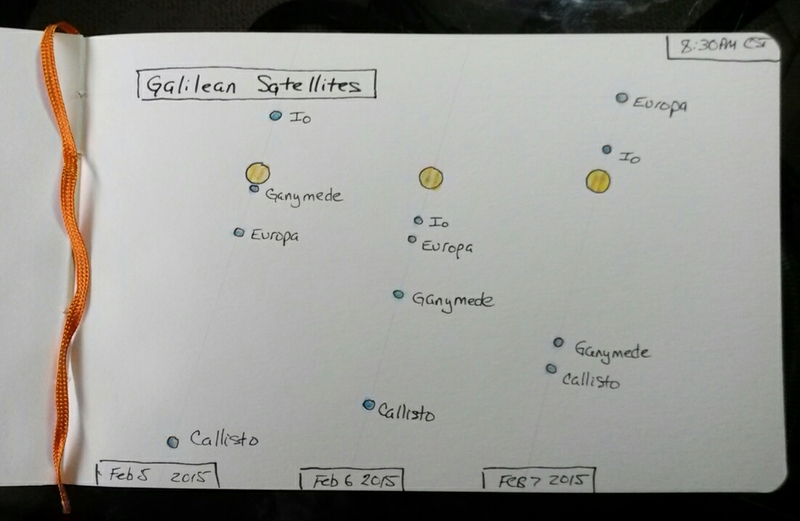 I enjoyed the Moment when Io covered Europe and sketched this nice scenery for my astro-log. 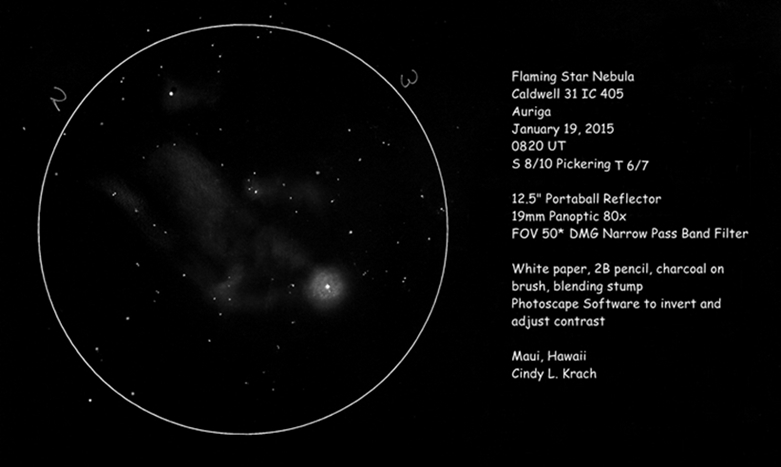 I used a 130mm reflector at 100x to make this sketch. 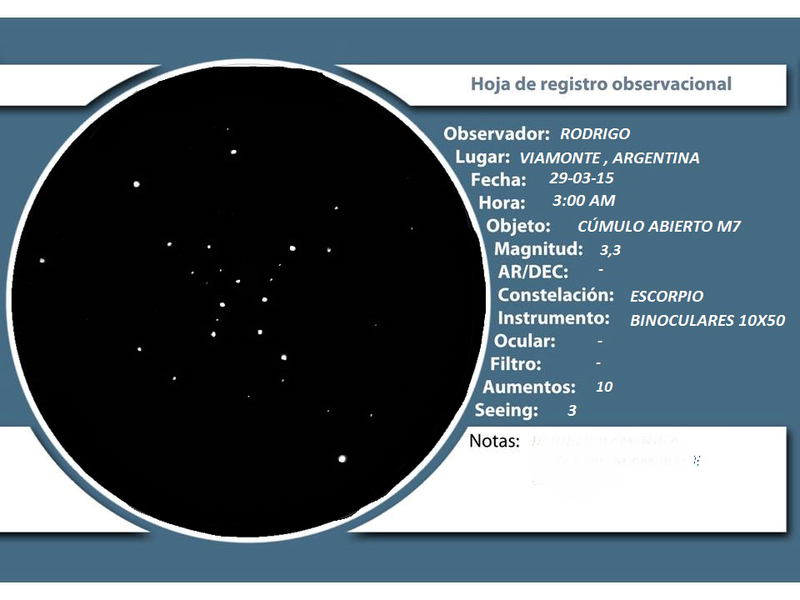 The weather was cold and clear with good seeing and a limiting magnitude of 5.4. Despite the good seeing, I had to be quite patient to see all the shadows. 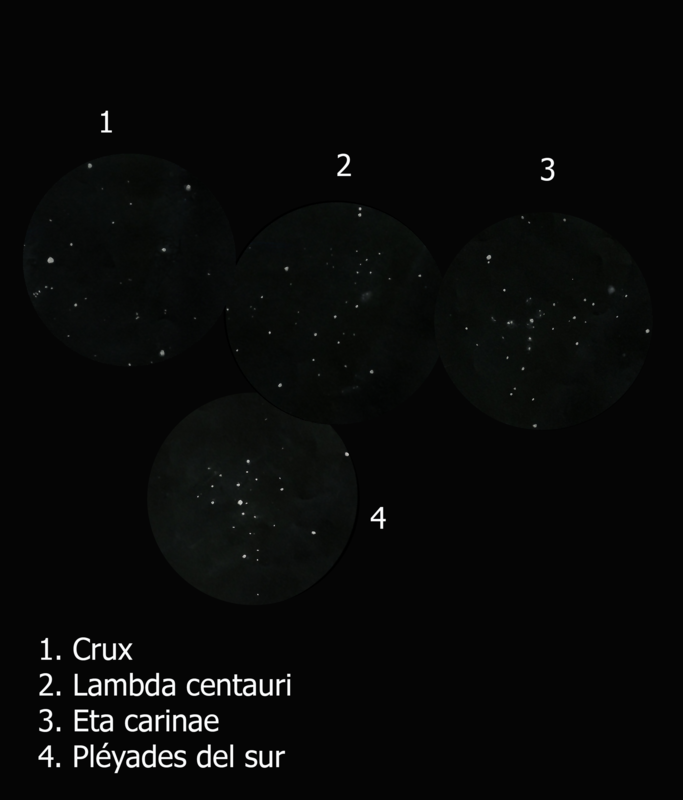 Callisto itself was easy but Io was quite difficult. It was wonderful to see the shadows suddenly appear during moments of good seeing but at other times not all of them were visible at any one time. 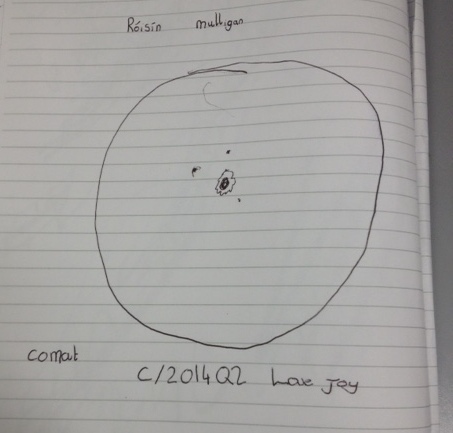 Róisín Mulligan is only nine , she had a look at C/2014 Q2 Lovejoy in my telescope for what was really a brief encounter. Like the other children in the club she was queuing up to see their first ever comet. 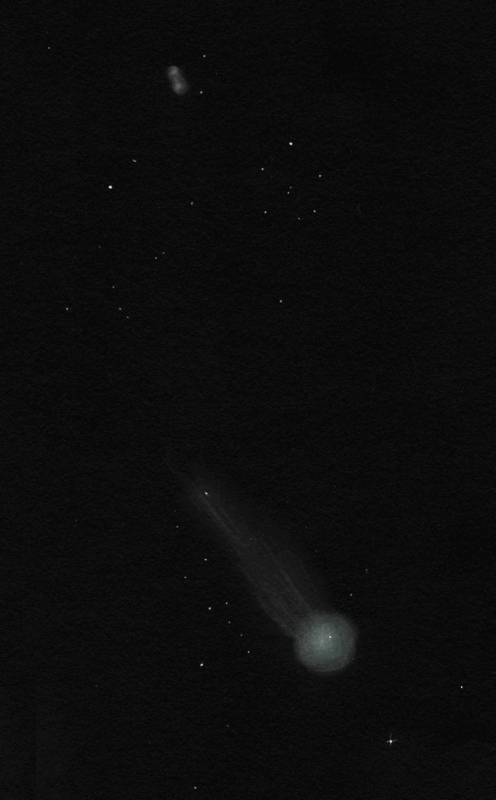 Somehow unknown to me she managed to produce a sketch in the dark in her own notebook , directly from her memory . This sketch surfaced when we returned to the classroom to finish up our meeting. What a great independant effort on her part , everyone was impressed. Viewed in a 200mm dob, 32 mm eyepiece ( 37X) with a 46 % illuminated moon in the way ! 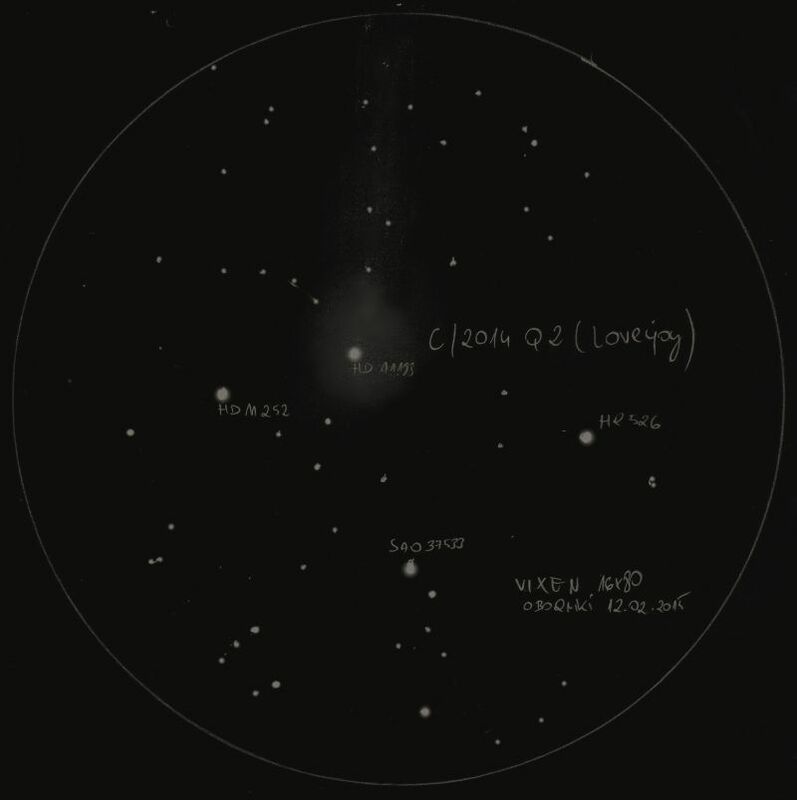 Róisín attends St Patricks National School Bray ,Co Wickow Ireland and is also a member of St Cronans Stargazers Astronomy Club at St Cronans National School in Bray. Well done Roisin, great work !! Media: Graphite pencil, white paper. 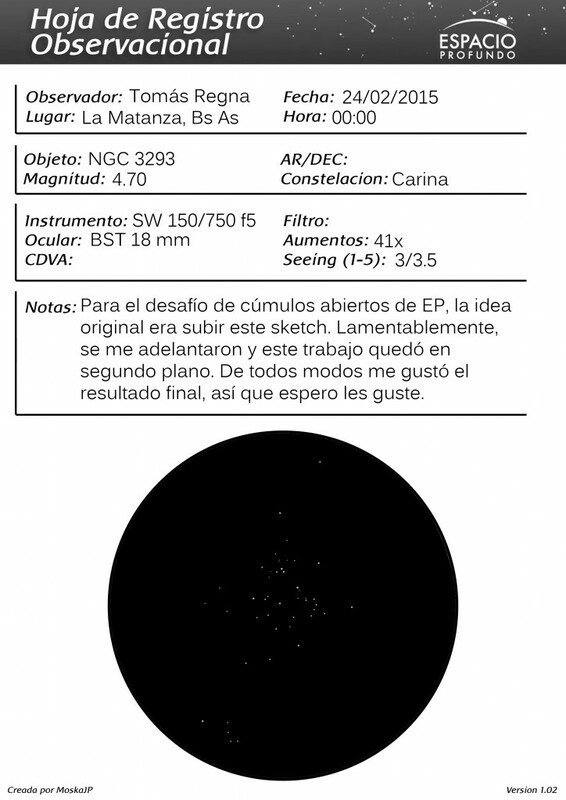 Equipment: Coronado PST and Baader Hyperion 13mm, azimut manual mount. SUPER SOLAR FILAMENT: It is, arguably, the second biggest thing in the solar system. A filament of magnetism almost 1,000,000 km long is stretching across the face of the sun. Only the sun itself is bigger. Stretched out, the line would fit 67 Earths! On Friday, January 23rd, there was a triple moon transit on Jupiter. 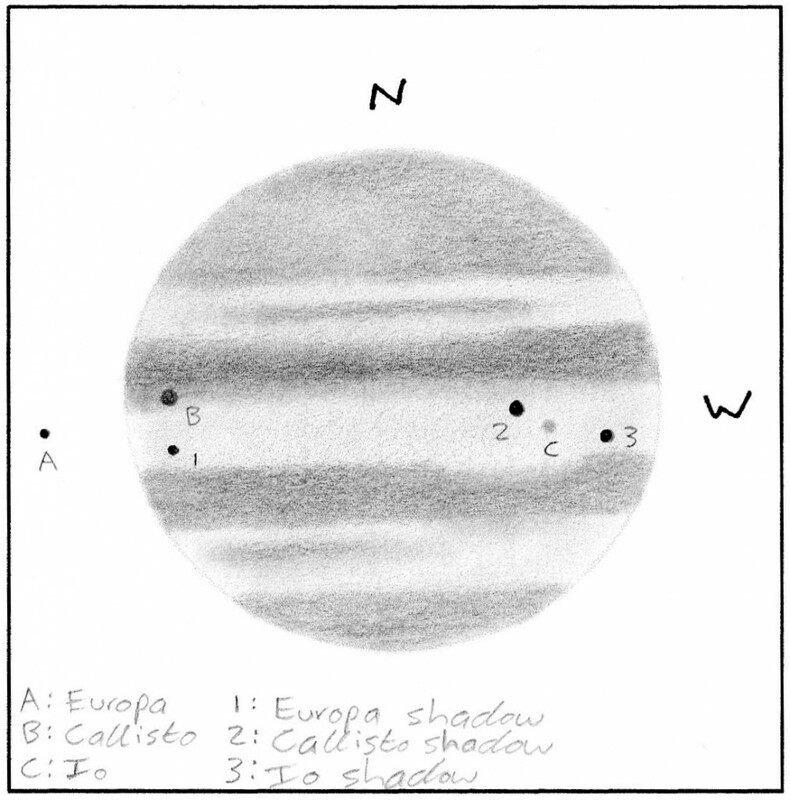 Io, Europa, and Callisto all crossed the planet’s disk and cast shadows on their way. 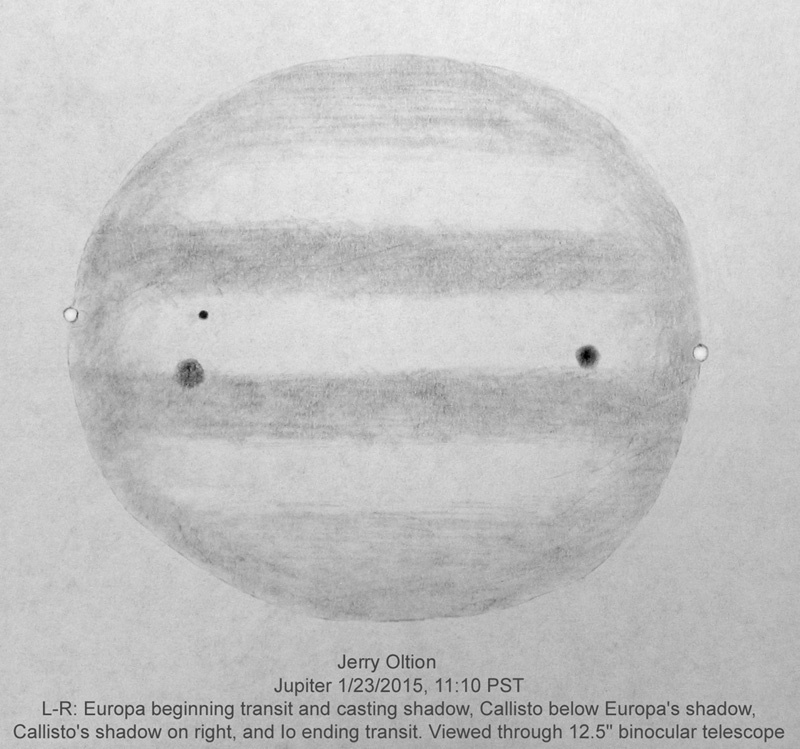 It was a busy night for several hours, but at 11:10 Pacific time the view became almost comical: Io and Europa made tiny ears on either side of the planet while Callisto and its shadow provided eyes and Europa’s shadow provided a mole above the left eye. The polar regions provided a stocking cap and a bushy beard. 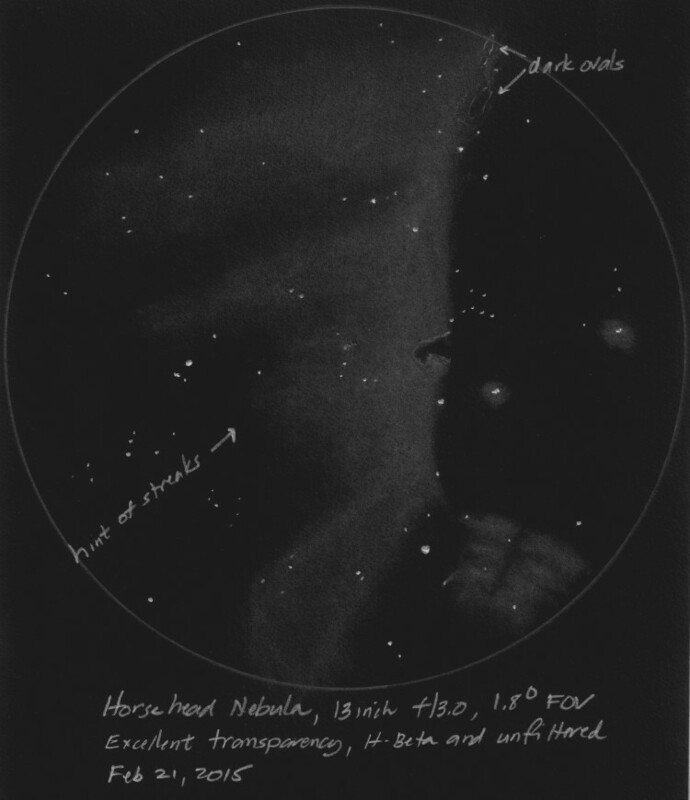 The view was through a 12.5″ binocular telescope, which added a 3-dimensional effect that really made the face stand out. 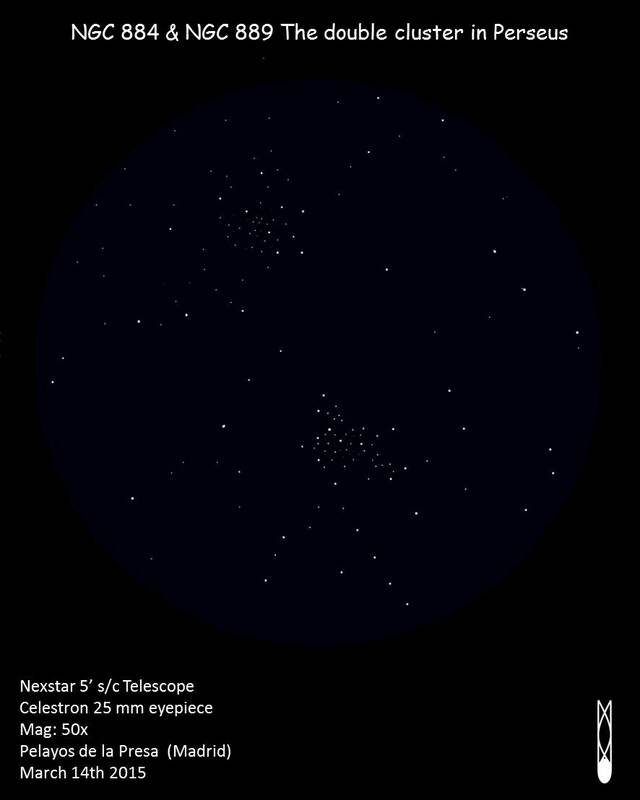 The extra mirrors in the binocular scope create an image that’s upside down but correct left-right.